The centralized control room is the dream of many in college sports-video production: instead of renting trucks or lugging gear across campus to remote venues, you have just one control room connected to everything. Though tempting, the concept has been prohibited by the cost and/or logistics. Fiber was the chief way to go, but running lines, in some cases, miles across campus wasn’t a reasonable solution for many. However, as the use of public Internet becomes more prevalent, media companies are becoming more confident in its use not only for distribution but for internal production transmission as well. At Harvard University Athletics, Director of Multimedia and Production Imry Halevi has established himself as someone who likes to experiment and develop unique and cost-effective ways to pull off a live production. Since he arrived on campus five years ago, the goal has been to centralize all of the school’s venues into a single control room. Although that was impossible in the past, developments in IP technology have made it a reality. This year, the school opened a second video-control room built to connect all the school’s athletics venues over the public Internet. Harvard has opened a second control room, this one at Lavietes Pavilion. IP technology enables it to serve as a centralized control room for virtually any athletics venue on campus. It was NewTek’s new NDI (Network Device Interface) technology that proved to be the game-changer for Halevi. Harvard, like many universities these days, has been investing a lot in connectivity for both general public-internet use and research-data transfer. So Halevi was fortunate enough to have a campus-wide Gigabit network already in existence. Although it wasn’t built for video transmission, he figured he could tag alone. The university gave him the okay. That proved a tempting sell to athletics administration, and Halevi received clearance to construct a second video-control room, this one located in the school’s basketball arena, Lavietes Pavilion. It supports basketball, soccer, swimming, water polo, and more and joins a control room already located at the Bright-Landry Hockey Center, which supports both football and hockey. However, thanks to these new IP workflows, any event can be run out of either control room. The new one in Lavietes Pavilion is built around a Blackmagic Design Universal 72×72 SDI/fiber Videohub router; features two production switchers, a Newtek TriCaster TC1 (for live broadcast) and a Newtek TriCaster 860 (for the videoboard); and has a NewTek 3Play 4800 for replay, a PreSonus StudioLive 16 Series III digital mixer for audio, and a Clear-Com LQ Series IP system for internal comms. For Halevi, IP is not an end but a means to achieve his ultimate goal of centralization. “IP is such an easy way to get there both in terms of labor/resources and in cost. I think that’s true for many universities. Dedicated fiber for video is something that you have to ask for and plan for. Internet is something that is top of mind for many schools for many reasons. 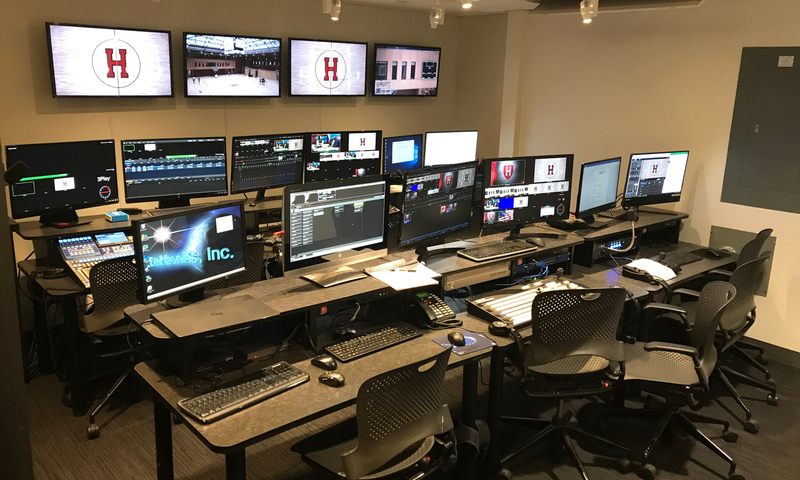 Through the help of these control rooms, full student crews will produce approximately 275 live broadcasts for distribution in various places, such as the Ivy League Network, ESPN3, and NESN regional sports network.